However, things do not have to be that way. Nearly every sales interaction with each prospect can be a success… if you know how to adapt to different buying styles! 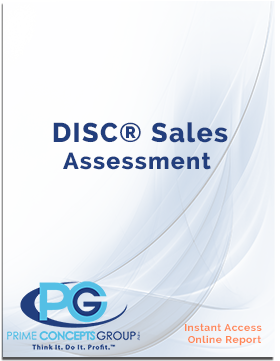 If you are interested in improving your sales results—immediately—we recommend that you start by taking the DISC® Sales online assessment first, so you can practice the proven techniques described within the report. You’ll first discover the strengths and weaknesses of your DISC® behavioral style. The DISC® Sales report will then help you to hone your ability to recognize the “style mode” being displayed by another person so you can then make small adaptations in the pace and focus of the conversation, which is the quickest, surest path to sales mastery! There are five definable phases to most every buying cycle (see the five phases below in part II of the report outline). Successfully guiding prospects through each phase will lead to more and better sales and positive outcomes for both of you. The DISC® sales online assessment is a resource for individuals and organizations desiring to improve sales and service performance and to positively persuade other people. The DISC® Assessment is valuable for individuals and all types of organizations; public or private, large or small.